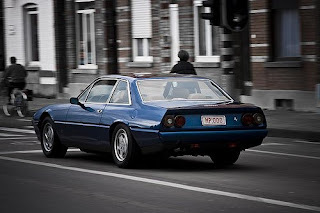 A Ferrari 412 in Kortrijk, Belgium. Bellissima! Back in 2005, Ferrari promoted its presence in China by inviting journalists to drive a pair of 612 Scagliettis 15,000 miles around China. 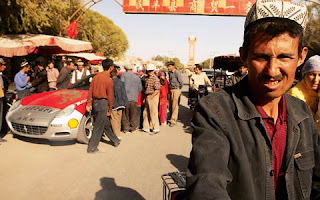 Part of the journey included Kashgar and crossing the Taklamakan. Modifications were minimal-- larger fuel tank, easily accessible fuel filter, skid plate, higher ground clearance, grill covered headlights, higher air intakes for water crossings. The scenery was stunning. The Ferraris, out of place. This is a "follow". General Pushkin and his girlfriend Rubavitch leave a North African Trade Convention in Tangiers. They get in a black Mercedes limo. There is a similar black limo carrying his entourage. Bond follows the two Mercedes in his Audi wagon to the Hotel Ile de France, where Pushkin is staying. Bond and Kara are in the mountains of Czechoslovakia in his Aston Martin V8. A Lada police car starts the chase. Bond uses a laser beam shooting out of his car's wheel hub to slice the Lada's frame from its body. A roadblock is set up with a MAN tractor trailer. Three Lada police cars are with the MAN. Bond blows up the trailer with missiles hidden behind his fog lamps. An army tracked vehicle and an APC join the Lada police cars. Bond drives onto a frozen lake. At first, his moving car is stuck inside a wooden shed. The army guys shoot him with AKs, big machine guns, and RPGs. Bond's driver's side front tire blows. He uses the sharp edge of the rim to cut a big circle in the ice. A Lada stops in the circle and sinks. Bond then deploys outriggers and studded tires. He fires a rocket hidden behind his rear license plate for the getaway. He and Kara crash into a snowbank and flee on foot. He sets his Aston for self-destruct. The one-car chase. Bond is in Gibraltar. The assassin drives away in a stolen British army Rover. Bond jumps onto the soft top roof. The assassin does everything to throw Bond off, including shooting through the roof with his silencer-equipped pistol. During this "chase", the Rover runs over a guard. Another guard shoots the back of the Rover, igniting the boxes of explosives it is carrying. The interior is filled with smoke. 007 cuts the roof and gets in. The Rover crashes through a souvenir shop, some tables and chairs, and sideswipes a car or two. It hits a brick wall and flies over a cliff. Bond gets out with his parachute. The assassin doesn't and the Rover explodes before it hits the water. Bond lands on a yacht. This is one of my favorite chases because it has the Renault 5 Turbo, one of my favorite cars of all time. Bond sees Fatima Blush escaping his villa after killing French agent Nicole. She flees in her red R5 Turbo. He chases her in his tricked out Yamaha, fresh out of its styrofoam container. Since she has a lead, he takes short cuts, sliding under a truck, and riding up and down stairs. A Camaro and a Peugeot sedan with Largo's men start chasing Bond. They trap Bond in a tunnel. The Peugeot nudges Bond and his motorcycle into a box truck. He escapes and jumps over everyone. With the Camaro in front of Bond and the Peugeot immediately behind, Bond uses his jet engine to "turbo boost" over the Camaro. The spectacle distract the Camaro and Peugeot, causing them to crash. Now, the chase is down to Bond and Fatima. He uses the jet engine again to jump from one pier to another. He follows her into a warehouse, where a large piece of wood belonging to a sailboat (I don't know the technical term) knocks Bond off of his bike. This is a "follow" we never quite see. Nicole, a French agent, drops Bond off at a Monte Carlo casino in her Peugeot sedan. He tells her to go back to the villa. The Peugeot passes a Citroen CX. Fatima Blush gets out of the CX to follow Bond. Before leaving the car, she tells her driver to follow Nicole to the villa. Jack Retachi just stole two nuclear warheads from Swadley Air Base in England. He leaves the base in his Ford sedan. Fatima Blush drives up to Jack in her bronze Mercedes SL, with the top down. She throws her snake into his car, causing him to crash into a building. She retrieves her snake and blows up the Ford by remote control. A bona fide chase. Stacey Sutton and Bond escape the fire at San Francisco City Hall. They steal a ladder truck belonging to the SFFD. About a half dozen Dodge Monaco and Plymouth Gran Fury police cars give chase. Geographically, there is no consistency. The chase starts at City Hall, goes down Market, then down Portrero Hill, through Van Ness, and ends at a fictional drawbridge. 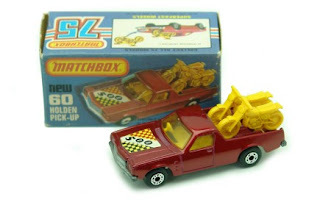 While this is all taking place, Bond gives up the driving and crawls back to the ladder, at first swinging wildly, and then driving the ladder car. The chase ends at the drawbridge. The operator is instructed to raise it. The fire truck jumps and makes it across. The police cars don't. As the bridge is raised, they slide backwards and crash into each other. One of the Monacos is crushed by the drawbridge mechanism. BBC America is rerunning the Top Gear Botswana challenge. Clarkson is in a stripped out Lancia Beta, praising the benefits of superleggera. 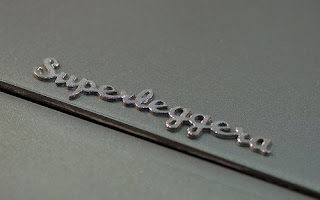 Superleggera. 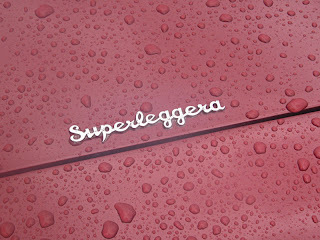 It means super light and denotes mid-century European exotics with metal tube frames. The cool thing about it is the added performance the improved power-to-weight ratio did for the cars, e.g. Aston DB4s, DB5s, Lambo 350GTs. The cooler thing is the sound of it-- super-le-JEH-ra. 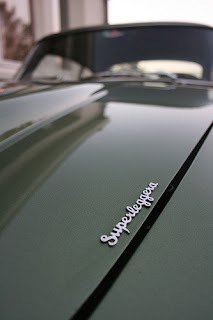 The coolest thing, in my opinion, is the discrete chrome badge adorning the hoods of these lucky automobiles. To catch sight of one, there is a burgundy Aston Martin on permanent display at the Imperial Palace car museum in Vegas. 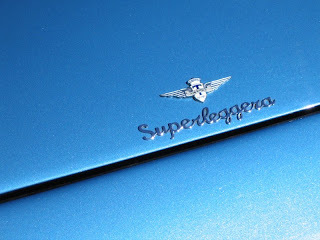 This August, at the Concorso Italiano in Monterey, there will likely be an old blue Lambo superleggera, my personal favorite. Another short follow. Stacey Sutton leaves her job at San Francisco City Hall (even though she has a state job) for home in her government-issued Jeep Cherokee. Bond follows in a Ford LTD, possibly the lamest car driven by a Bond, ever. Sutton lives in a mansion in the East Bay, which happens to be the Dunsmuir House. A short follow. Pola Ivanova, a KGB agent, bumps into James Bond after they both (independently) swam to check out Zorin's oil pump in the San Francisco Bay. She gives Bond a ride in her Corvette. General Gogol follows in a mid-80s Thunderbird. They end up at the Nippon Relaxation Spa in Japantown. Pola thinks she gets away with an audiotape, runs to Gogol's Thunderbird, and away they go. Only after they drive away do they realize that Bond switched the tapes. 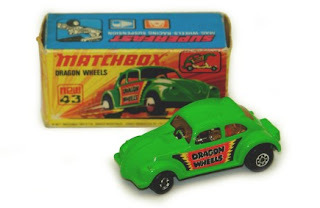 I had a fantastic collection of Matchbox, Tomica, Hot Wheels, and Corgi cars. Condition-wise, they fall into two categories. My pre-1980 vintage cars are ratty and worn down. The stickers have come off; parts are missing; and barely any paint is left. My post-1980 cars, on the other hand, are in pretty good shape. 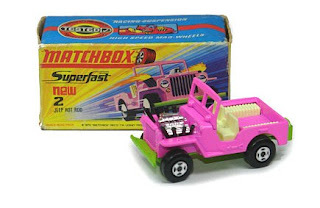 I wanted to see what my 1970s era Matchbox cars looked like new. And that's when I stumbled on this German site. It brings back fond memories. 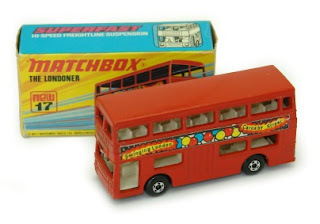 London bus. Everyone had one of these. The livery stickers on mine are gone and the red paint is barely recognizable. Holden pick-up truck. 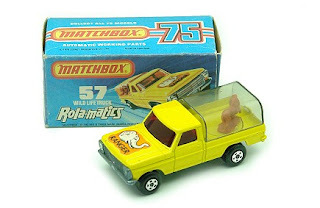 This toy taught me what "pick-up" meant. The coolest features are the plastic motorcycles that come off. Hot rod Jeep. A little on the flamboyant side, color-wise. The black pieces of plastic poking out of the engine hurt. Ford zookeeper's truck. My plastic lid was missing. As you rolled the truck, the removable lion on the truck bed paced in circles. Now that's ingenuity. VW Beetle. The body lifted up on a hinge like a funny car and a plastic stand inside propped the body up. Another car that amused me for countless hours. With 178 cars, SUVs, and trucks down and a little more than a dozen to go, it is becoming extremely difficult to track down the remaining vehicles. Identifying them is also becoming more difficult. I'm doing my best but if you see any errors or omissions, feel free to point them out. 179. Central African Republic. Here we see Bozize atop an FJ40 Land Cruiser. 180. Vietnam. 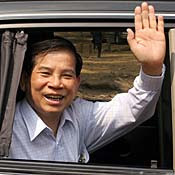 President Triet is seen here recently waving from his 1980s Japanese sedan, with frilly curtains. I am 85% sure that it is an old Toyota Crown. 181. Burkina Faso. 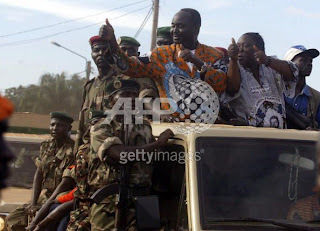 Compaore's predecessor was famous for ditching government Mercedes for a fleet of Renault 5s. Compaore is just the opposite. His official ride isn't this army runabout, but the white Cadillac Escalade seen following him. 182. Samoa. 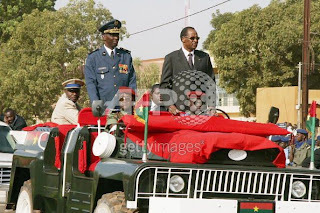 The head of state is seen here stepping out of what appears to be a Holden. One of each of the following: Lancia, Hyundai, Skoda, A6, Peugeot, Renault, Lincoln, VW van, London taxi, Daimler, Toyota Century, Hongqi, Bentley, Rolls, Ford Fairlane, Aston Martin, SEAT, Ford Expedition, Nissan Patrol, Stutz, Suzuki, Camry, Toyota Sequoia, Proton, Land Rover, Ford F150, Mitsubishi Galant, Hummer H1, Chrysler Imperial, Mitsu L200 pick-up, Mazda truck, E-class Merc. This is a tale of three island nations-- Taiwan, Nauru, and Tuvalu. Taiwan needs friends in the international community. China is snatching up diplomatic recognition at a fast clip. Taiwan is relegated to being friends with about two dozen poor countries in Central America, the Pacific, and Africa. It keeps these friendships with "donations" like medical supplies, catered banquets, and scholarships. Nauru and Tuvalu are two such friends. 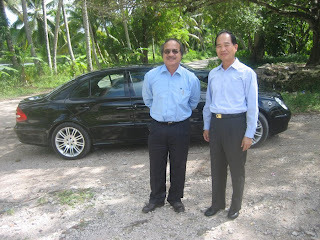 That's how I found these two leaders' rides, on Taiwan's foreign ministry's website. 177. Tuvalu. With a population of 12,000, it is not a rich country. Its GDP is about $20 million. A tenth of that income is from selling the rights to the internet suffix ".tv". More than a few eyebrows were raised when Taiwan generously donated $13 million to build the island's government center. At three-stories, it's the tallest building in the country. Tuvalu is made up of a number of desolate islands. When the prime minister visits a neighboring island, he has to ride in whatever is available. And in the case below, he had to ride in a Mazda truck. 178. Nauru. Nauru has a sad story. It measures just 8 square miles. It used to be covered with bird poop and was a phosphate "gold" mine. Unfortunately, all of the poop has been shipped away and billions of dollars in proceeds have disappeared. Here we see President Scotty last year in front of his E-class Mercedes. Nauru is mired in debt. One of each of the following: Lancia, Hyundai, Skoda, A6, Peugeot, Renault, Lincoln, VW van, London taxi, Daimler, Toyota Century, Hongqi, Bentley, Rolls, Ford Fairlane, Aston Martin, SEAT, Ford Expedition, Nissan Patrol, Stutz, Suzuki, Camry, Toyota Crown, Toyota Sequoia, Proton, Land Rover, Ford F150, Mitsubishi Galant, Hummer H1, Chrysler Imperial, Mitsu L200 pick-up, Mazda truck, E-class Merc. I have 17 countries to go. Bond and Tibbett are at Zorin's French estate. Bond sends Tibbett to town to run an errand. Tibbett drives a Rolls Royce, which happens to be Cubby Broccoli's personal car. A Renault Fuego driven by Jenny Flex and Pan Ho as a passenger follows Tibbett to a BP station. They distract Tibbett while he drives the Rolls through a car wash. There, May Day emerges from the Rolls' back seat and kills Tibbett. Try to find the Michelin Bibendum in the scene. This is one of the top five Bond chase scenes. 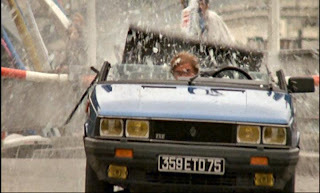 Bond steals a Renault taxi cab at the foot of the Eiffel Tower to chase May Day, who is parachuting over Paris. He drives down steps. He lands on a bus. He has the roof of his car lopped off. He drives the wrong way. He has the back half of his clipped off. He keeps driving and parks it at a bridge. He jumps over the bridge and into a party boat where May Day had just landed. He can't find her, as she was just picked up by Max Zorin in a waiting motorboat. Bond needs to get to an American base in West Germany to defuse a nuclear bomb. He steals a woman's Alfa GTV while she is preoccupied in a phone booth. Two Polizei BMW 5 series and a BMW motorcycle give chase. Bond crashes through the air force base gate. In violation of protocol, the MP allows the Germans to continue chasing Bond on the base. A Chevy belonging to the MPs briefly join the chase. The Chevy crashes into a circus trailer. Bond escapes on foot.